Introducing Sea-Thin™, the original, patent-pending marine thermogenic, containing natural fucoxanthin from edible brown marine vegetables. This unique marine vegetable extract is combined with pomegranate seed oil high in health-promoting punicic acid in a patent-pending combination. Sea-Thin can be taken any time of day because unlike other thermogenics, Sea-Thin is non-stimulant and will not cause jitters. 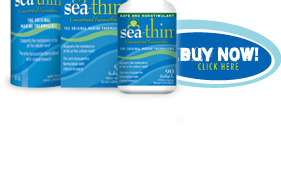 Sea-Thin™ is a thermogenic unlike any other. A patent-pending combination of concentrated fucoxanthin from specially cultivated and extracted edible brown seaweed and cold-pressed pomegranate seed oil. All marine extracts are not alike. The cultivation and extraction process required to create Sea-Thin's high natural fucoxanthin concentration was the result of seven years of research and development by leading marine scientists. The combination of proprietary cultivation methods and a proprietary extraction method creates an all-natural concentrate with levels of fucoxanthin that are 250%-500% higher than wild harvested seaweed, along with other beneficial marine carotenoids and marine omega-3 essential fatty acids.